The list cut across personalities from 26 African countries with Nigeria, South Africa, Ghana and Tanzania taking the lead with 20, 17, 12 and 8 representatives respectively. Nigerian Gospel singer, Traimi Dave, headhoncho of RockTown Records, Frank Edwards also made the list. Notable among the 2018 honourees are Uganda’sRobert Kyagulanyi Ssentamu (Bobi Wine) , Togo’sFarida Bemba Nabourema, Egypt’s Mohammed Salah, Nigeria’s Kenny Blaq, Traimi Dave, Davido, Falz and Tomi Adeyemi Idaminab, South Africa’s Cassper NyovestandTanzania’s Ali Kiba. 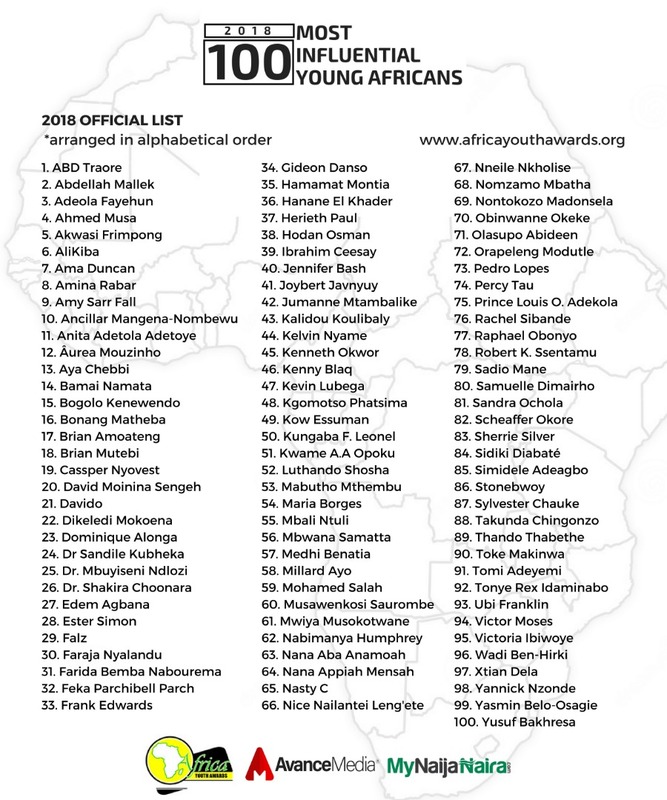 The list was compiled in partnership with Avance Media , mynaijanaira.com and Made Marketing Group presents an opportunity for young Africans to stay committed to their individual causes and continue to blaze trails across their various fields.